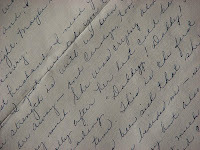 ...my second challenge for WeScrap's Love Fest crop is to write and include a love letter on a layout. It might be long, it might be short. It might be out there for all to see (and read) and hidden in a creative way. It might be to your husband or your child (or your morning cup of Starbucks). It's all up to you. Check out the challenge post in the WeScrap forum for official rules and deadlines.